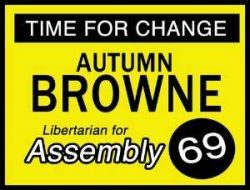 The Libertarian Party of California is hosting a 2018 Orange County Libertarian Candidate Meet and Greet Fundraiser on on Sept 8, 2018 from 7 pm to 10 pm. Enjoy snacks, dinner, drinks, and dessert and meet and greet the 2018 Libertarian Candidates. Learn about their platforms. Hear about their campaigns. Participate in a fund-raising auction.